Time lock switches are manual switches found in t-rail on the mainline. 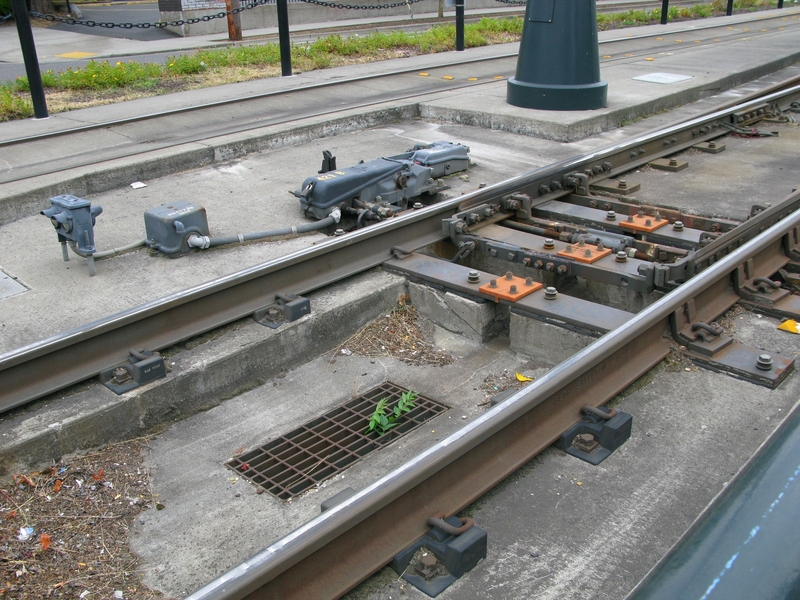 Like all other mainline t-rail switches, they are padlocked for safety. However, these have an additional lock built in where the switch can’t be thrown until a timer has counted down, hence the name. They will have a sight glass on the switch machine that displays the status of the lock – it’ll show the word padlocked, which is what will be there under normal operating conditions while the padlock is in place; locked – which is that status after the padlock was removed but before the timer is up; and unlocked, meaning that the padlock has been removed and the timer has run out, so the switch can now be thrown. 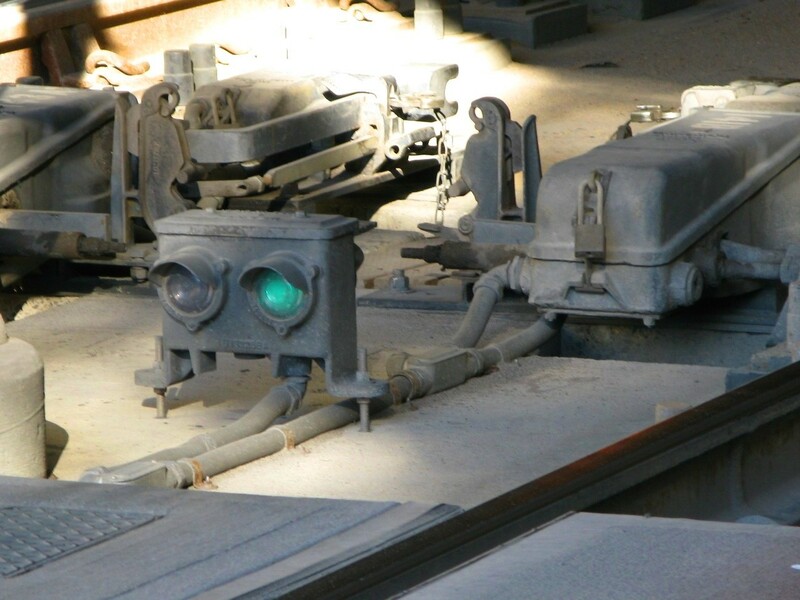 If there is no train detected in the approach circuit where the switch is, the timer takes 17 seconds before the switch can be thrown, and this will throw up reds on all the ABS signals around it to prevent a train from entering the circuit. When a train leaves 60th on a green, it’s clear to proceed for 2 ABS blocks, meaning that the intermediate signal should be yellow (which tells you that you’re clear to proceed into the Hollywood platform). However, if the switch for the pocket track is thrown after the train leaves 60th, the intermediate signal 46 will not be the expected yellow – it will be red to prevent the westbound train from entering the circuit after it. This is why operators can’t run on autopilot and just assume what their signals will be! If there is a train in the circuit approaching a time lock switch, it takes 4 minutes and 17 seconds before the time lock timer runs out and the switch can be thrown – this is done as a safeguard to give the train time to get out of the circuit before the switch is thrown. 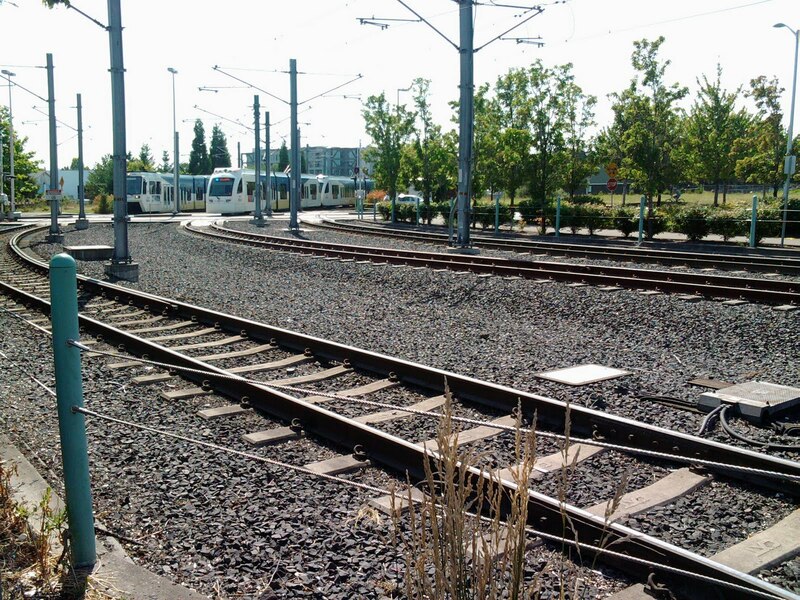 So if you’ve ever wondered why the Red Line trains in the center track at Beaverton can’t keep going west… well, they technically can, but those switches immediately west of BTC from the pocket track that the Red Line sits in are time lock switches that will take 4 minutes and 17 seconds to throw if you’ve got a Red Line in that circuit. These work a little bit differently – first, the timer on the Interstate time lock switches takes 60 seconds to count down. And unlike the other time lock switches, the timer doesn’t start once the padlock is removed – because of the way Interstate is set up, Control will run the timer. 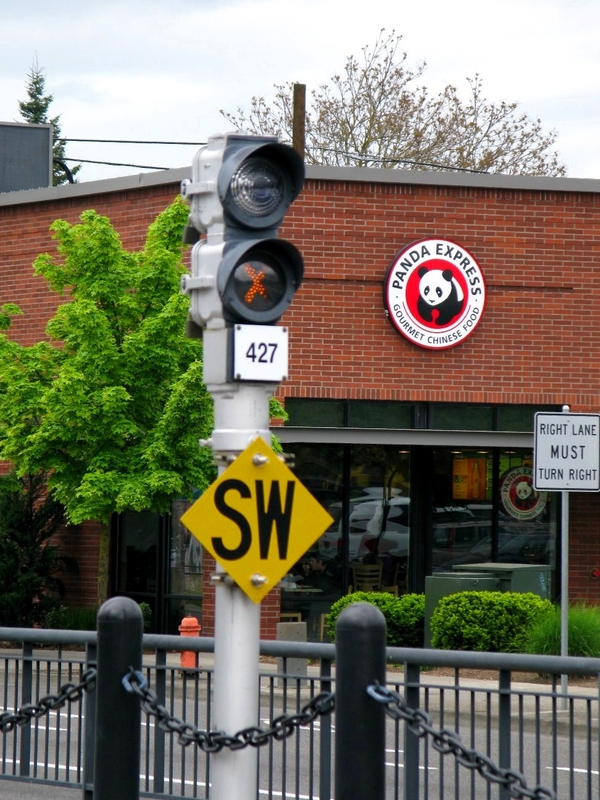 What are the Lunar/Red signals along Interstate Ave. for? This question refers to this “signal” (and others like it) located on Interstate Avenue. It’s actually not a lunar and red signal – the only other thing it can display is a yellow X which you can sort of see here, but that’s pretty rare. Do you the locations of them and the numbers of them? There are four of them – 421 located at the northern edge of the N Prescott St platform and 423 located near the pedestrian crossing at N Sumner. Then further north, there is 427 near the N Lombard platform and 429 near N Winchell St. I also noticed that all of the other signals on the system are even-numbered but these ones are odd-numbered..do you know why? I have also noticed that they don’t have an “N” before the number..is there also any reason for that? These aren’t signals like the ABS or combination signals – as I mentioned before, these are called summary switch indicators or also advanced switch indicators (so that’s why they’re not numbered the same way the signals on Interstate are because they are not signals in the same sense of the word). These indicators are associated with switches at the crossovers on the Yellow Line Interstate alignment. And similarly, indicator 423 is associated with switch 423A & B, and indicators 427 and 429 are associated with switches 427A & B and 429A & B. As you might have guessed, these switches are all time lock switches. For safety, once the padlock of one of those switches on Interstate is removed, the summary switch indicator will display a yellow X instead of a lunar. Any train that approaches a summary switch indicator with a yellow X MUST stop and call Control for permission to proceed – it doesn’t mean that the switch has necessarily been thrown, but it does mean that the lock has been removed and that’s reason enough to require permission from Control before continuing. The setup here is different because unlike the time lock switches found elsewhere in the alignment that are protected by ABS signals, Interstate is in pre-empt territory. Other point of interest – as I’d said before, emergency vehicles can drive over the rails on Interstate because it’s embedded in the pavement. But it’s t-rail, not girder rail, and so the switches aren’t going to be embedded. So these orange reflectors that surround the crossover switches on Interstate let emergency vehicles know they need to clear out of the tracks before they get to the reflectors since they can’t drive over the switches. This entry was posted in alignment, alignment "what is? 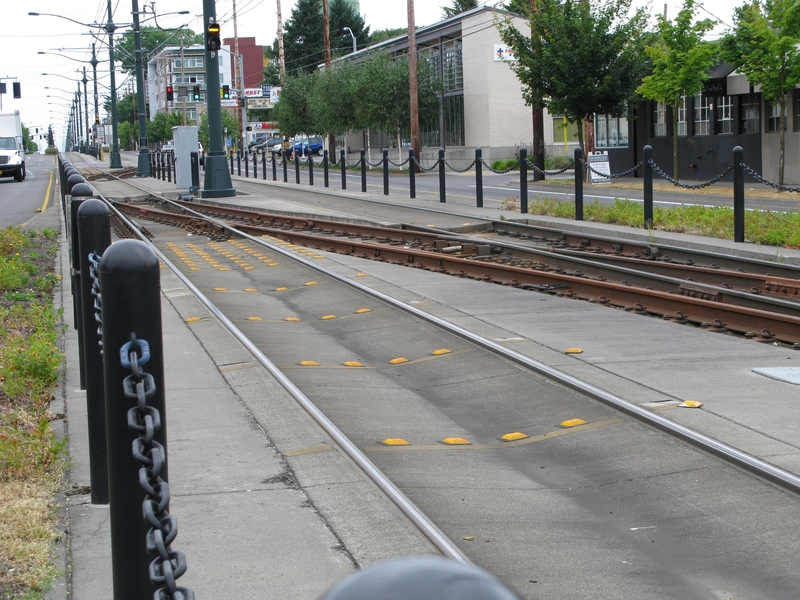 ", safety, switches and tagged light rail, max train, portland, public transit, public transportation, rail, railroad, safety, switches, trains, trimet. Bookmark the permalink. 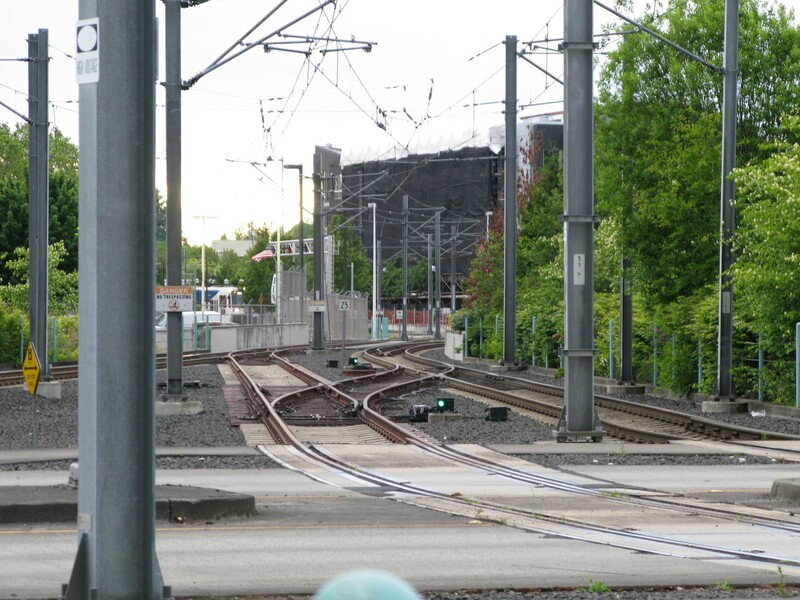 So I have a question… When going eastbound off the Steel Bridge into Old Town/China Town there is a box with a button at cab height… what does this do? There seems to be similar ones when going east or west entering/leaving Burnside east of 102nd AVE right at the curve, the east bound one is just before the left hand turn to move onto Burnside. And the west bound one (if my memory serves me correctly) is right at the sign when entering the ABS zone. Oops… when going WEST off the steel bridge, not east. I believe those are used by operators to get signal preemption (when it doesn’t happen automatically) so they can get across the intersection. Kind of just like crosswalk signal buttons. Thanks for answering my question. I’m a bit of a rail geek and I’m always interested on how the entire system operates. I don’t think most people realize how complicated the entire rail system is. No you’re right, I don’t think people give the complexity of the system a lot of thought. In a way I think that’s a testament to everyone who keeps things running smoothly (at all levels – the maintenance workers, operators, controllers, supervisors, etc) that most passengers don’t *have* to think about all of those moving pieces! Thanks for answering some of those questions I sent in! The only time I was anywhere close to those signals was when I’ve ridden the train up there so I just assumed they were a Red/Lunar signal..I couldn’t notice the X, but as with everything else, now that you’ve explained it, it makes much more sense now, thanks again! Also, Funny PDX77 should mention the working of the system..I was just talking with a family member tonight about how technical it all is and how much it is like a living breathing creature. It’s very technologically advanced and very fun to learn about! Yes! It’s a great blog! 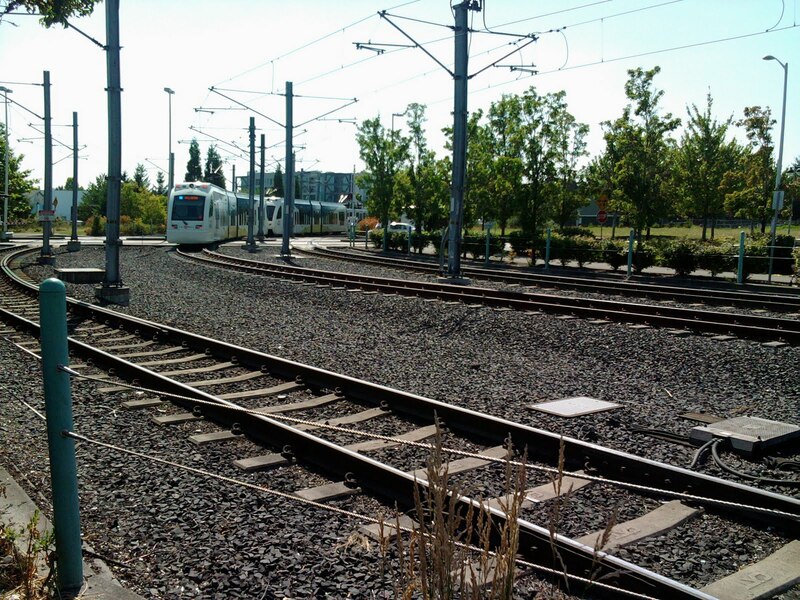 Between your blog and this blog, I am always able to get my TriMet-fix for the day! PS I hope to get a chance to come ride your bus before I go back to school on the first. Do you still get the same two days off as you did at rail? 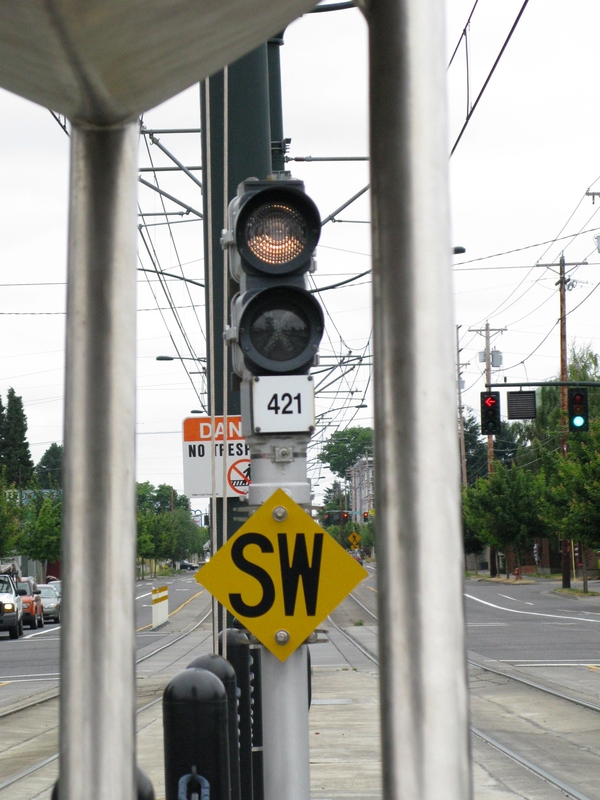 Are the crossover switches between Beaverton Creek and Millikan Way time lock switches or manual switches? 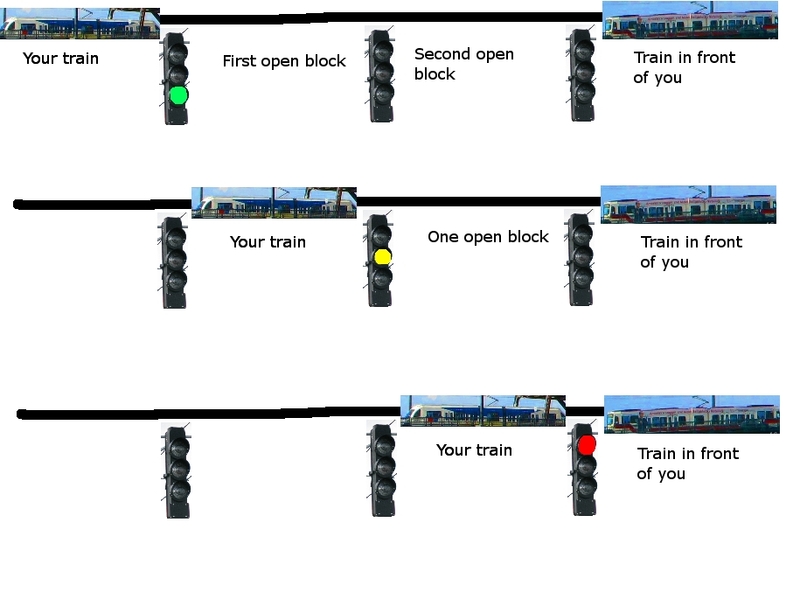 Same question for the crossover switches at Orenco and Washington/12th. Also, are the switches for the Fairplex pocket like the switches at Hollywood or are they all manual or time lock..I don’t believe there’s a TWC code for the Fairplex pocket.. Remember, a time lock switch is a manual switch. Not all manual switches have a time lock on them, but all of the time lock switches are manually thrown. But I understand what you’re asking. Yes, the switches just east of Beaverton Creek are time lock switches, and the switches west of Orenco and east of Washington are as well. I’m sorry I phrased it that way, I wasn’t really thinking. But thanks for your clarification! Don’t worry, you’re doing well – even more so when you consider that you’ve never had formal training in any of this!